On December 22, 1965, Ruth Cannon died, bringing an end to a life of extraordinary dedication to preservation and to North Carolina history. 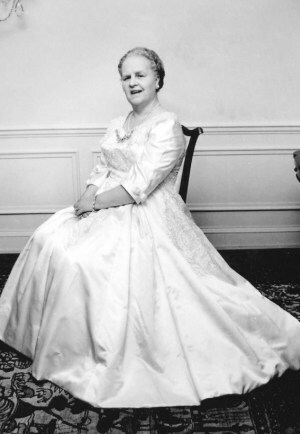 Born Ruth Coltrane into a banker’s family in Cabarrus County, she married Charles Cannon, longtime president of Cannon Mills Company in Kannapolis. A history major at Greensboro College, Cannon was a stalwart member of heritage groups including the Colonial Dames and the Daughters of the American Revolution. Cannon’s true mark, however, came about independently of those organizations. In 1939, she was among the founders of the North Carolina Society for the Preservation of Antiquities, a group that continues to exist today under the name Preservation North Carolina. That same year she headed the book committee for the Garden Clubs of North Carolina and began an initiative that resulted in the publication of pioneering Old Homes and Gardens of North Carolina. She presented a copy to Governor Clyde Hoey late in 1939. Cannon was instrumental in organizing the restoration of Tryon Palace and Historic Bath, and she helped to found the Elizabethan Gardens in Manteo. The Cannon Cup, which she established and is named for her husband, has been given each year since 1948 for distinguished work in historical research, preservation and restoration.